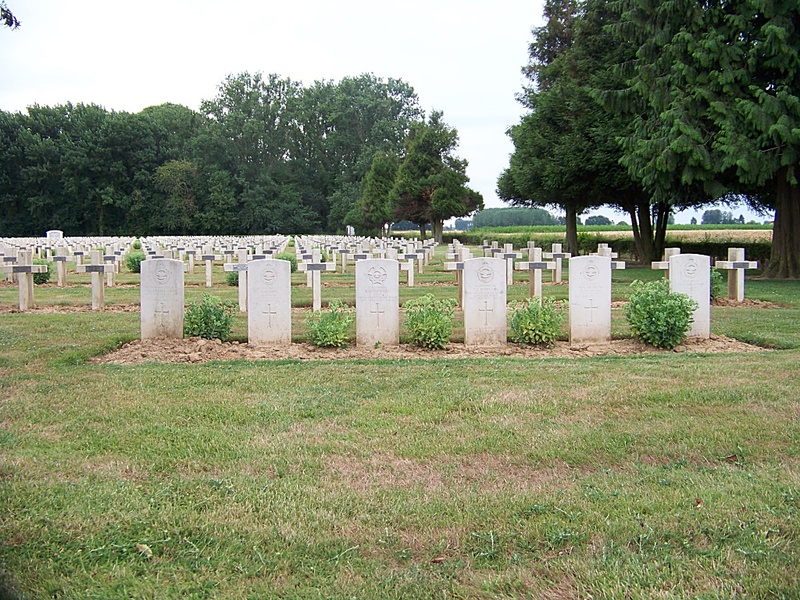 Maucourt is a village and commune 34 kilometres east-south-east of Amiens. The French National cemetery is about 635 metres north of the village on a by-road leading to the neighbouring village of Lihons. 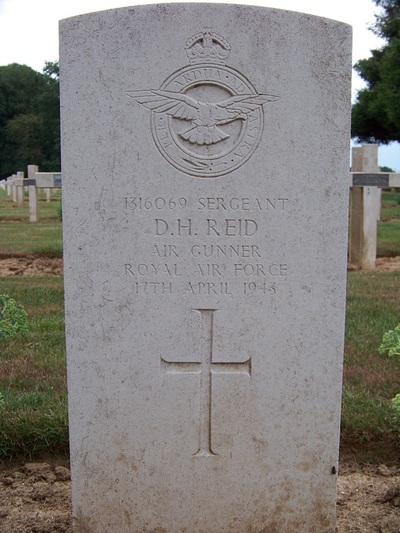 In the south-western corner are the graves of six airman who fell during the 1939-1945 War. Five of them belonged to the Royal Air Force and one to the Royal Canadian Air Force. 626794 Flight Sergeant Dennis Axtell, D. F. M. Wireless Operator/Air Gunner in 51 Squadron, Royal Air Force, died 17th April 1943, aged 22. 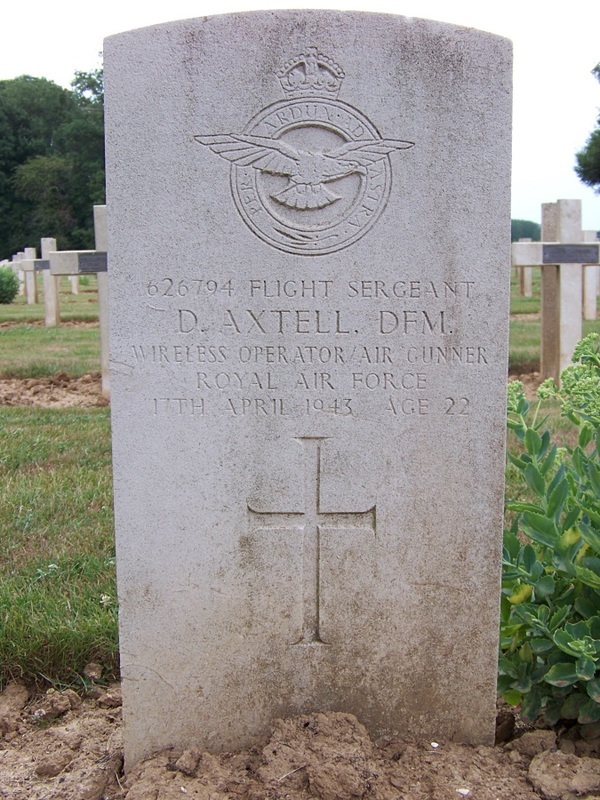 Son of Allan and Vera Axtell; husband of Agnes Axtell, of Belfast, Northern Ireland. 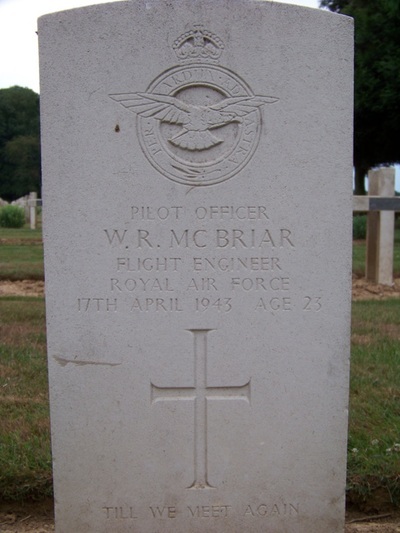 51909 Pilot Officer William Robert McBriar, Flight Engineer in 51 Squadron, Royal Air Force, died 17th April 1943, aged 23. Son of William James Norwood Owens McBriar and Cathrine Stewart McBriar, of Belfast, Northern Ireland. 1316069 Sergeant Donald Harold Reid, Air Gunner in 51 Squadron, Royal Air Force Volunteer Reserve, died 17th April 1943. 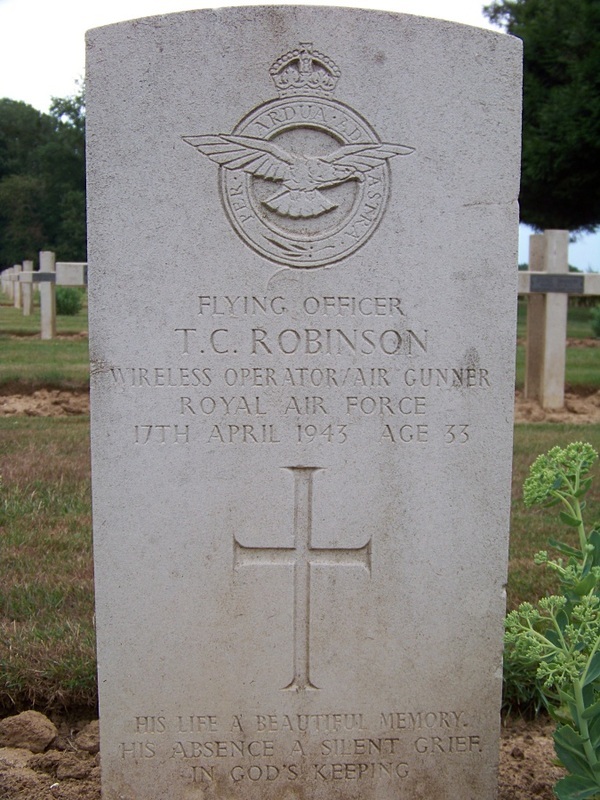 120669 Flying Officer Thomas Collis Robinson, Wireless Operator/Air Gunner in 51 Squadron, Royal Air Force Volunteer Reserve, died 17th April 1943, aged 33. 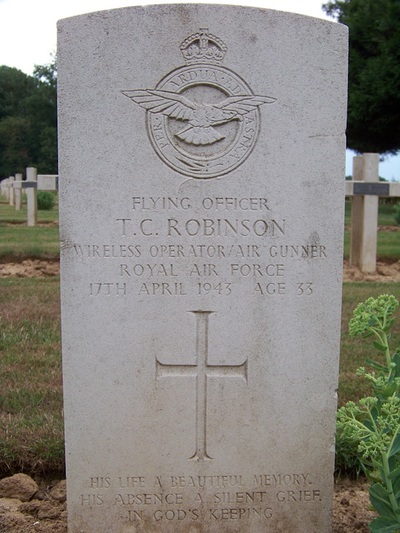 Son of Thomas Frederick and Kate Robinson; husband of Muriel Constance Robinson, of Brislington, Bristol. J/17100 Pilot Officer Ronald Henry Stewart, Pilot in 51 Squadron, Royal Canadian Air force, died 17th April 1943, aged 21. 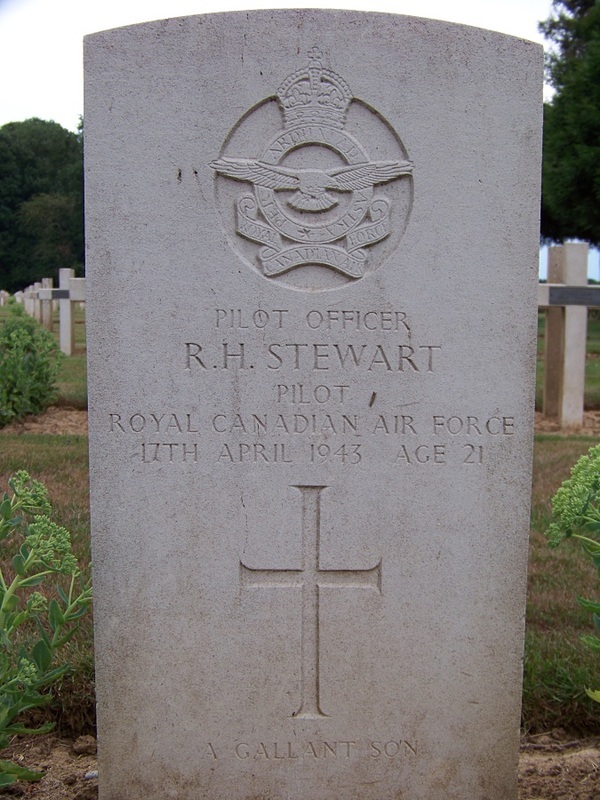 Son of Alvin Claude and Dorothy Jane Stewart, of Welland, Ontario, Canada. 144266 Pilot Officer Frank Malcolm Thompson, Air Gunner in 51 Squadron, Royal Air Force Volunteer Reserve, died 17th April 1943, aged 34. 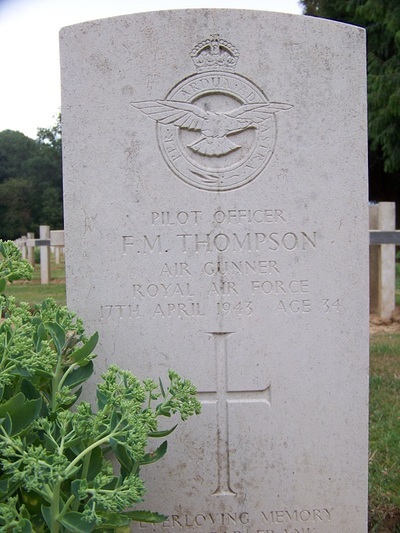 Son of Fredrick Thompson, and of Molly Thompson (nee-Payne); husband of Frances Violet Thompson, of East Barnet, Hertfordshire.